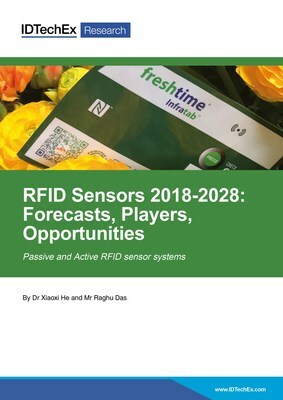 As explained in the new IDTechEx Research report RFID Sensors 2018-2028, there are several RFID sensor options which can each work at different RFID frequencies. The most established technology has been battery assisted RFID sensors, which use a power source to take sensor measurements. More recently there have been battery-less (passive) RFID sensors which only take sensor readings while close to the RFID reader which energizes it, limiting their application as a result. Passive RFID sensors are, however, simpler and cheaper since no power source needs to be integrated. RFID Sensors 2018-2028 provides thorough research on RFID sensors, with over 100 organizations covered, case studies, detailed market projections by technology and frequency, as well as current and future challenges and opportunities. IDTechEx has studied the global RFID market since 1999, bringing in-depth, impartial insight based on direct interviews with suppliers and users. For more information see http://www.IDTechEx.com/rfidsensors.